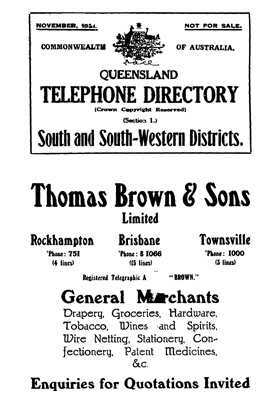 These directories list thousands of Queensland telephone numbers, arranged in a similar way to today’s telephone books. They're a valuable genealogy resource for anyone searching their family history or building a family tree. "What information can I find in these directories?" They contain alphabetical lists of both people and companies, together with their telephone numbers for each town or suburb throughout various regions. Some entries also include the individual telephone owner's occupation or street address. They also include call rates and hours, telegram rates, how to place a call or telegram, postal rates, wireless licence information and general telephone information.